Continuing our new series of collaborations with political science journals, we are pleased to present the following guest post from University of Georgia political scientist Ines Levin discussing her article “Political Inclusion of Latino Immigrants: Becoming a Citizen and Political Participation” that appears in the current issue of American Politics Research. In conjunction with this post, SAGE will make the article freely available to all for the next 30 days; you can download it here. The ongoing debate on the Senate immigration bill raises important questions for political science. In particular, what are the consequences of providing a path to citizenship for the economic and political advancement of immigrants? Just as it is often taken for granted that legal status and citizenship contribute to economic mobility, the notion that acquisition of citizenship contributes to the political incorporation of immigrants is often taken as a self-evident truth. Acquiring citizenship is certainly necessary for the political inclusion of immigrants, since it is the only way for individuals to gain access to basic forms of political participation in a democracy, such voting and contributing to electoral campaigns. But is citizenship sufficient for ensuring broad political incorporation? If this were the case, one would expect naturalized immigrants to be more deeply engaged than their non-citizen counterparts when it comes to non-electoral community and political activities open to all immigrants. These questions are addressed in my current article in American Politics Research. A naïve comparison of the behavior of naturalized and non-naturalized immigrants based on data from the 2006 Latino National Survey indicates that acquisition of citizenship might indeed stimulate involvement beyond the ballot box. 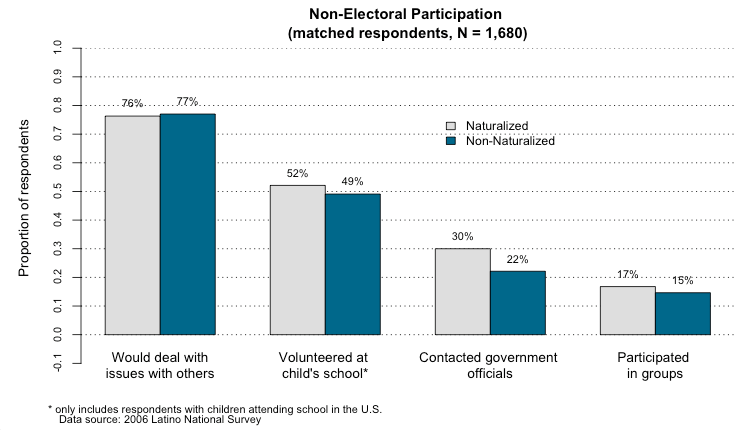 While both naturalized and non-naturalized Latino immigrants are very likely to say that they would work with others through groups or organizations to deal with issues that need to be addressed, the naturalized are more likely to report that they participated in the activities of a group, tried to contact a government official, or volunteered at their child’s school. In particular, the naturalized are more likely to say that they participated in the activities of groups including non-Latino members or that they contacted non-Latino officials relative to their non-naturalized counterparts. But the unequal involvement of naturalized and non-naturalized immigrants is not necessarily caused by differences in citizenship status. Immigrants who have and have-not acquired citizenship come from different countries (and also from different regions within the home country, in the case of Mexican immigrants), settle in different areas of the U.S., and have different levels of pre-immigration political involvement. Both types of immigrants also have unequal access to politically relevant resources long thought to affect political participation such as educational attainment, income, and English language skills. Moreover, the naturalized have usually spent more years in U.S. (and in their current homes) and are typically older. Differences like these might explain both observed inequalities in non-electoral participation and differences in citizenship status. Indeed, the probability of acquiring citizenship conditional on the above-mentioned attributes is considerably lower among the non-naturalized than among the naturalized, suggesting that the process of assignment to citizenship status is anything but random. One way to address the question of whether differences in political engagement are driven by citizenship itself, or by differences between the kind of people who have naturalized and those who have not, is to “match” the research subjects on measures such as length of residence. After using propensity score matching to control for observable differences between naturalized and non-naturalized immigrants, inequalities in political participation are greatly reduced. 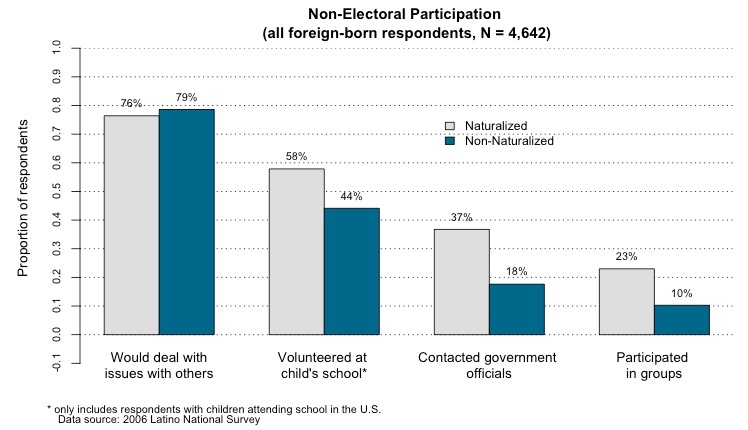 While the naturalized are still more likely to participate in most non-electoral activities than similar non-citizens, differences are small and no longer significant. The exception is contacting government officials, although a sensitivity analysis indicates that differences in propensity to contact are highly sensitive to bias that could have been caused by differences in unobserved factors between both immigrant types. 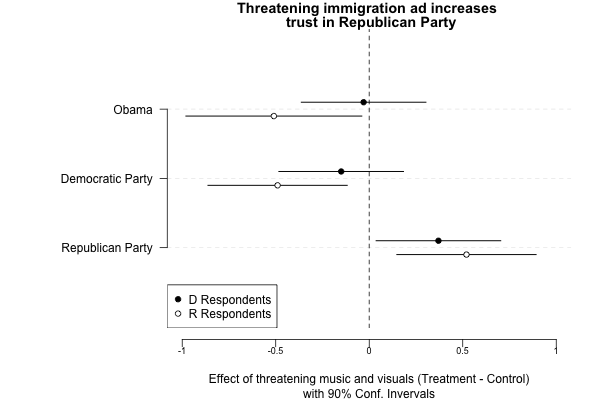 In sum, when one compares similar naturalized and non-naturalized immigrants, the resulting evidence lends little support to the hypothesis that naturalization leads to greater political involvement. Although it seems intuitive that going through the naturalization process should lead to greater attachment to the American identity and principles – including a sense of the importance of fulfilling one’s civic duty – a number of factors might reduce the effectiveness of naturalization for making more involved citizens, including: absence of civic infrastructure in settlement areas, experiences of discrimination, and inadequate access to resources. As long as immigrants are exposed to some of these limiting factors, the provision of a path to citizenship might not be enough to ensure that the naturalization process produces civically engaged citizens who are capable of bearing participation costs. Note: I thank Sean Ingham and Alex Street for their very useful comments on this blog post. Now, perhaps there are unforeseen events that will permanently help the GOP among Latinos and that have nothing to do with immigration reform politics in 2013. 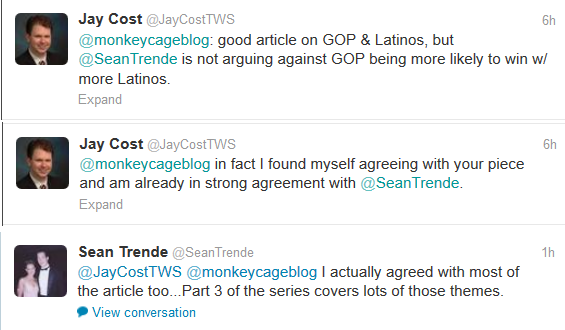 But if I’m the GOP, what I’d bet on is this: “We’ll be more likely to win presidential elections if we win more Latino votes.” (And if that seems obvious, read Sean Trende’s counterpoint. Not everyone agrees.) And supporting immigration reform, in turn, will make that more likely. 1) While we agree that Latinos are not yet “locked in” as part of the Democratic base, Trende and Cost are more sanguine about the need for the GOP to appeal to Latinos. Both Cost and Trende have emphasized that a (the?) key to understanding 2012 is what they allege are “missing white voters.” Thus, they argue, the GOP can succeed in national electoral politics—for at least a while—by shoring up its support among white voters and betting that black turnout will decline without Obama on the ticket. (See Trende here. Cost agrees here. See also this rejoinder from Nate Cohn and two rejoinders from Ruy Teixeira and Alan Abramowitz.) But I think a broader appeal to Latinos is a better bet for ensuring Republican electoral success in the long run—and it will take work on the GOP’s part beginning now. I’m not suggesting that all Latinos will end up believing the GOP is against them. I’m not suggesting that there aren’t some Latinos who now identify or will identify as Republicans for other reasons. I’m not suggesting that the GOP won’t win larger numbers of Latino voters in individual elections than they did in 2012 because of cyclical factors like the economy or idiosyncratic factors like the particular candidates who are running. I’m just suggesting that the GOP should be asking itself, “How do we convert some of these unaffiliated Latino voters into habitual Republican voters?” And that takes more than economic growth or, say, nominating Marco Rubio. The GOP and Democrats should pursue the policies they believe are best for the country. If they govern competently, the coalitions will take care of themselves. Right now, the the majority of Republicans in Congress seems to think that the best policy is not comprehensive immigration reform as it is currently envisioned—e.g., with a path to citizenship, etc. (That could be wrong, however, for the reasons Jon Bernstein suggests.) So if I’m interpreting Trende and Cost correctly, they are giving the GOP license to do something that I think is more likely to hurt the GOP’s appeal among Latinos than help it. Could the GOP Lose Generations of Latino Voters? The handful of studies on Latino party identification tends to emphasize its variability across elections as a result of the candidate position-taking on key issues, and the fact that parental socialization of American politics is nonexistent for immigrants (Wong 2000; Alvarez and Bedolla 2003; Nicholson and Segura 2005; Uhlaner and Garcia 2005). A common understanding in the scholarly research on partisanship is that today’s immigrants do not have fixed or set party allegiances. There is no research to date that non-citizen immigrants have pre-existing party attachment that they take with to their naturalization ceremony. Rather, immigrants are seen as responsive to the political environment in which they find themselves and develop party attachment as they become citizens, register, and start voting. In fact, an empirical look at the data confirms this theory. That is Adrian Pantoja writing over at the Latino Decisions blog. Their polling shows that 71% of non-citizen Latinos identify as independent or with a minor party, or have no attachment of any kind. There is a large number of Latinos who, once naturalized, will seemingly be up for grabs. This gets at my concern about what would happen to the GOP if immigration reform fails. I am not someone who believes that the 2008 and 2012 elections—and Obama’s success in winning Latinos votes—mean we are heading to a Democratic dynasty in the White House. There are plenty of other reasons why Republicans may win presidential elections and other elections even if they do not immediately broaden their appeal to Latino voters. But part of my skepticism about the Democratic dynasty is predicated on the notion that, over the longer run, parties aren’t irrational. They adapt to secular trends in the country—shifting public attitudes on certain issues (like gay marriage), shifting demographics, etc. Or they adapt enough that those trends won’t prove fatal and then they can go on to win (or lose) elections based on other things, like the cyclical trends in economic fundamentals. This prevents dynasties from occurring. If I were the GOP, I’d be thinking about the long game. They don’t need to win the majority of Latino votes now or even in the near future. But, other things equal, they should want to shape the “political environment,” to use Pantoja’s term, so that many of these unaffiliated Latinos will, once naturalized, view the GOP as a party that could represent them. One prominent theory of party identification is that people identify with the party that they associate with social groups they like or belong to. So it’s not so much about policy, or what the parties “stand for.” It’s who the parties “stand with.” The challenge for the GOP is that even if it supports other policies that many Latinos support, its hostility to immigration reform may be the driving force behind a broader impression: that the Democrats are “the party of Latinos.” And once those impressions are formed, they are very difficult to change. As I’ve noted, the perception that the GOP is the “party of the rich” really has not changed for 60 years. Now, how firmly established is any impression that the GOP is not “the party of Latinos”? Probably not that firmly established, especially in the minds of Latinos that are not yet citizens. Most are unaffiliated, as noted, and only 25% identify as Democrats and 3% as Republicans. But among those that are naturalized citizens? Nearly half, 44%, identify as Democrats and only 15% as Republicans. In other words, the 22-point advantage Democrats have among non-citizen Latinos becomes 29 points among Latino citizens. This, to me, suggests that the “political environment” is not currently working in Republicans’ favor. La frase ya se está haciendo recurrente en el Capitolio: “No me gustaría estar en los zapatos del presidente de la Cámara de Representantes John Boehner (R-OH)”. En un lado tiene al extremo de su partido que no acepta nada que se acerque a la legalización. En el otro, enfrenta las amenazas que auguran un futuro político fatídico si no permite un voto con esta opción. How is the GOP going to be able to get information in front of Latinos that helps them view the party in favorable ways if Latino opinion leaders won’t provide it? That’s a not a sure bet, of course. But it strikes me as the safer one. First, advocates of a path to legalization of illegal immigrants should take heart that a steady majority supports that idea, even when weaker alternatives are proposed, and that among Republicans, a plurality backs the notion that Dreamers deserve a shot at becoming citizens. From new California poll data reported here by Berkeley political scientists Jack Citrin and Morris Levy. I just finished an article for the Georgetown Public Policy Review that you might be interested in. I took a thorough look at the influence of the Hispanic vote in congressional races in 2012, and how the party balance in the House changes under different levels of Hispanic party support. 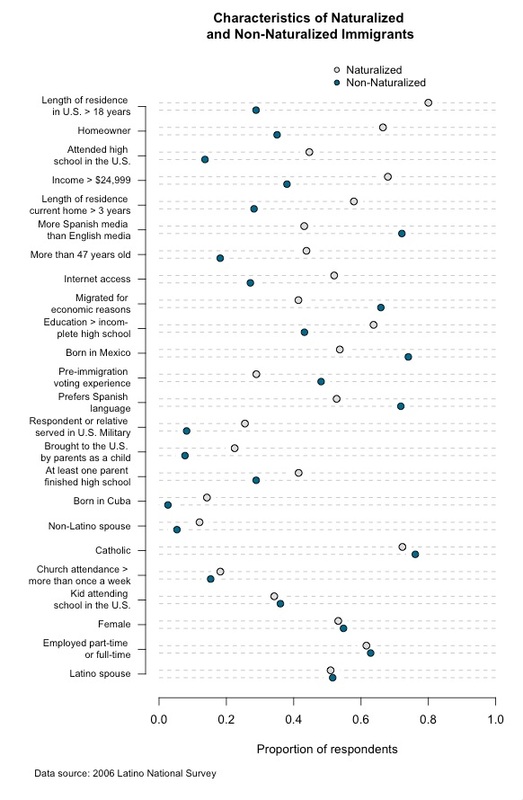 I used this to gain some insight into the prospects for immigration reform, and the results are really interesting. There’s also a few nice graphs and maps. I have to say that I’m suspicious of analyses where the rebound is bigger than the main effect, but that’s just a hunch on my part, not a serious analysis.